What goes with condors? Cow skulls of course! My sons and I set off on an adventure at the San Diego Zoo this morning – we like adventures. I was worried about having to face the Spring Break crowds but the place was quite empty when we got there at 9am. Surprisingly it wasn’t even crowded when we left after lunch. I heard that since Easter has such a late date this year, schools are spreading out their Spring Breaks across the whole month of April. It’s good for San Diego locals like us since it evens out the rush of tourists. We feel we still have the city for ourselves for a few months before this summer. We went on a long trek throughout the zoo, meeting the newest baby giraffe and howling with the wolves (yes, you can do that – check out my post on Howling with the wolves on my other blog). A zoo visitor passing by giggled at my son’s howling but he stopped right in his track when he heard and saw the wolf howl back. I really have to get a video of it next time we go, for the memories. 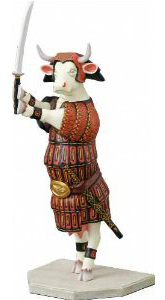 Check out the pair of horns on that cow, nice! It’s funny how cow skulls are an inherent part of the Southwest desert landscape. Don’t they seem to show up in every Western movie, good or bad? My son commented that the zookeepers have to put bones in the enclosure since that’s what the condors eat. I wanted to clarify that condors eat the meat off the bones, but I figured he was on the right track. We’re so lucky to live close to the San Diego Zoo and be able to take a close look at so many species anytime we want. If you’re ever in San Diego, the Zoo and the Wild Animal Park should be on your must-see attraction list. 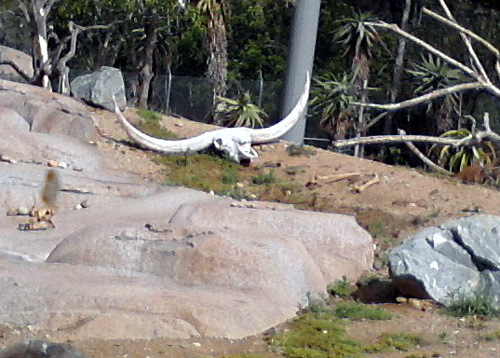 Then you can see this cow skull for yourself, and maybe stop by the artic wolf enclosure for a little howling exercise. 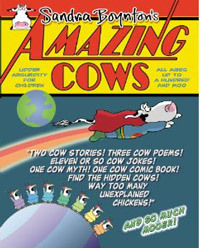 Previous Post What happened to the cow who jumped over the moon?